Pooltrackr has been unveiled for the first time to pool and spa industry professionals, in an exclusive beta testing session at the annual SPLASH! Pool and Spa trade show on the Gold Coast, Queensland this week. 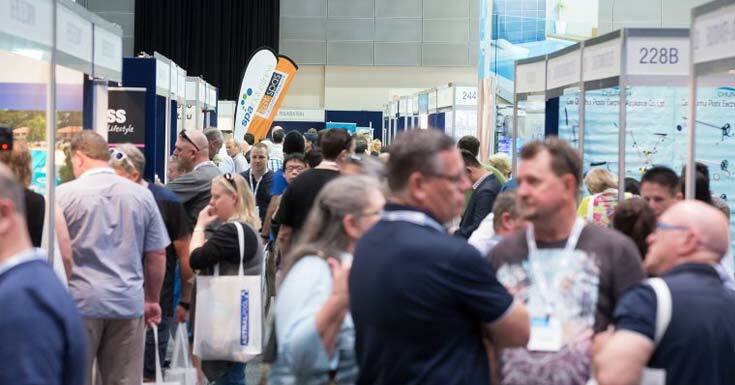 Thousands flocked to the pool and spa industry’s largest event in Australia to see the latest in pool and spa innovation and safety, and we were honoured to be involved! Pooltrackr CEO and Founder (ex pool technician), Ben Richards was running the stand, alongside Pete Fenley (ex pool shop owner) where they showcased the beta version of Pooltrackr to pool technicians, pool servicing business owners, pool shops and media. There was an overwhelmingly positive response from everyone the team spoke to, with several attendees coming back for a second look and to ask more questions on day 2! Darren from Tweed-Byron Pool Services was one of many pool technicians who expressed his excitement at the potential Pooltrackr has to improve the way his pool business works. “I was impressed by the simplicity and how easy it was to use. The concept is exciting, convenient and will change the way we do business,” Mr Holland said. “I’d been looking for something like this for a long time”, was heard over and over, with many pool technicians expressing their frustrations with other systems that function, but are not designed with pool servicing front of mind. We’d like to thank everyone who took the time to check out Pooltrackr, giving us some really useful feedback that we can take back to the rest of our team for some serious discussions ahead of our projected launch date in a few weeks. To those we did not get to chat to properly, or you didn’t make it to the event, please feel free to contact Ben directly ben.richards@pooltrackr.com if you have any questions, or would like to organise an online demo of Pooltrackr. Next year we will definitely be back at SPLASH! … with a bigger stand and more staff! Here’s to the next few months. We can’t wait to show you what we have in store.